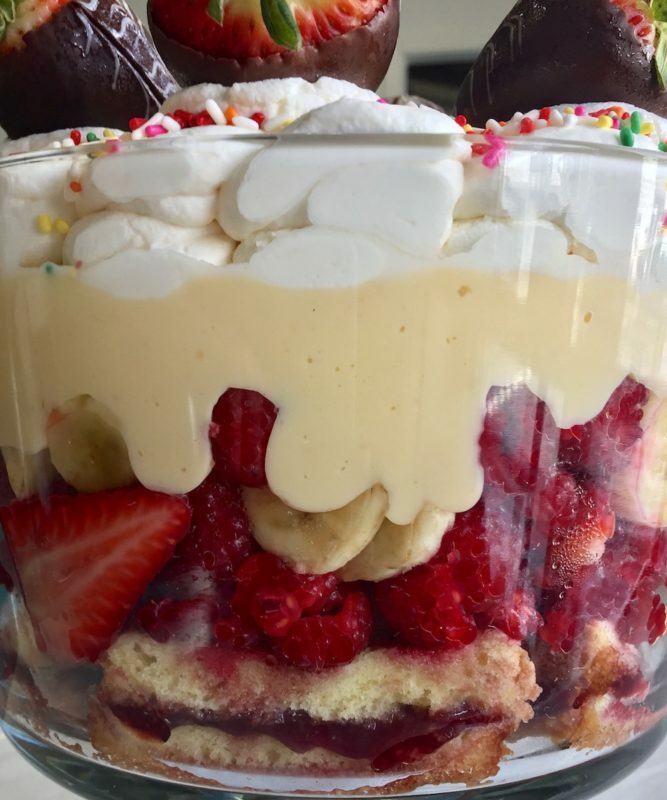 Sherry Trifle: Trifle in English cuisine is a boozy dessert made with a layer of sponge cake or fingers soaked in sherry, a fruit layer, and a custard layer. It’s then topped with whipped cream. 1) Cook the heavy cream over medium heat, just below simmering point, stirring occasionally with a wooden spoon. 2) While the cream is heating, whisk together egg yolks, sugar, cornstarch, and vanilla in a medium bowl. Once the heavy cream reaches simmering, temper the cream into the egg mixture by gradually pouring the cream into the eggs and whisking constantly. Return to the same pot over medium heat and continue whisking until the custard becomes thick and smooth (until it reaches simmering point). 3) Pour the custard into a glass bowl and cover the surface with cling wrap. Place in fridge to cool. 1) Create mini “sandwiches” by slicing the sponge cake / lady fingers in half, lengthwise. Spread half with raspberry jam and place the other on top, then divide into 3 pieces. Lay each piece inside and sideways up a large bowl, creating a single layer of cake. Pour the dry sherry atop to absorb the liquid. 2) Scatter the raspberries, bananas and strawberries over the sponge cake, then pour the chilled custard over the fruit. 1) Whip the cream until thick and spoon over the custard layer. Garnish with sprinkles and chocolate strawberries (optional). 2) Place in the refrigerator until ready to serve. 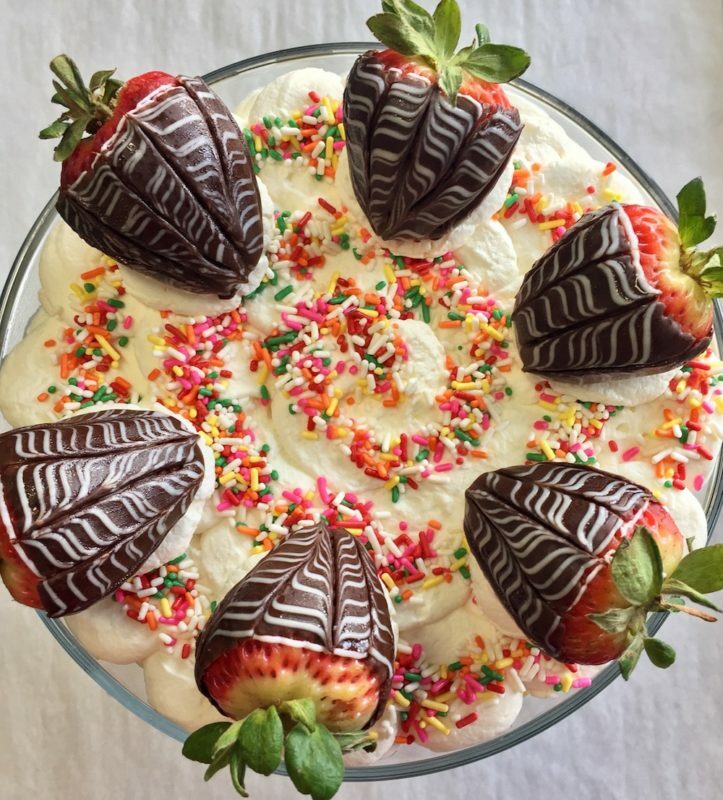 This entry was posted in Blog and tagged dessert, recipes, sherry, St. Patrick's Day, strawberries, trifle.